At the Aruba School in the Mediterranean coastal town of Shehat, less than a mile from a grassy hillside covered in Roman ruins, a poster bearing Colonel Muammar Gaddafi's picture is being used as a doormat. School is not in session. But in the current state of limbo gripping eastern Libya, or "Free Libya," as some are calling it, the Aruba School is serving a different function. It is a prison for nearly 200 suspected mercenaries of the Gaddafi regime. Libyan soldiers who have defected from Gaddafi's ranks stand guard at the school's gates, draped in belts of ammunition and cradling machine guns  more to protect their hostages than to keep them from escaping, some locals whisper. A group of civilians from the nearby towns has gathered at the gates. They want to get a glimpse of the "African mercenaries" who they say killed their families and neighbors last week. Shouting breaks out. The guards let them into the school's lobby and then hold them back. "They are scared that they will hurt the Africans," says Tawfik al-Shohiby, an activist and chemical engineer. The soldiers have good reason to be protective. Rumors abound in this restless region on Libya's eastern Mediterranean coast about the identity of the forces who fought the protesters for days before eastern Libya fell, as they say, "to the people." At the ransacked airport of Labrak, on the road between the towns of Darna and Beida, where clashes were fierce, Gaddafi's government flew in two planes of foreign mercenaries on Wednesday night to fight the protesters, say the airport employees standing amid the wreckage. The protesters accuse Gaddafi of sending foreigners from Libya's southern neighbors of Chad and Niger because he had no one else to support him. They say the mercenaries were rounded up and paid to fight. And they have found ID cards from Niger and Chad to prove it. One activist displays a traveler's check for 15,000 Libyan dinars alongside a matching national ID card from Chad, as well as a stack of others. At the Aruba School, contained in a series of cold, thinly insulated classrooms, roughly 200 suspected mercenaries huddle beneath blankets on mattresses on the floor. Captured by rebels in the streets and from nearby army bases, some prisoners say they were moved several times before arriving at their makeshift prison. Given their claim that there were once 325 of them  flown in from Libya's southern town of Sabha  the remaining men consider themselves lucky. Many were captured during fierce clashes between residents and Gaddafi's forces last week; in the ensuing chaos, a group of men from al-Baida executed 15 of the suspected mercenaries on Feb. 18 and 19 in front of the town's courthouse. They were hanged, says the country's former Justice Minister Mustafa Mohamed Abd al-Jalil (who has quit and joined the revolution). It wasn't entirely planned, but the people here were enraged. Most of the prisoners say they were recruited in Sabha, a town deep in Libya's Sahara that is heavily populated by Gaddafi's tribe. Ali Osman, head of a state-affiliated youth organization, says they fell victim to invitations to attend a pro-Gaddafi rally in Tripoli, only to wind up on an army base in al-Baida. In the chaotic firefights that rattled this coastal region late last week, some of the men were captured, others were killed and some are missing. But there may not be a single or clear answer to who exactly the Aruba School prisoners are. "There are snipers among them, but they won't talk," says a guard, pointing his finger at the huddled individuals in the room, containing Ali and 75 others. Ali insists they are innocent. "We were brought to the airport in Sabha and told we were going to participate in peaceful protest in Tripoli to support Gaddafi," he says. After a 1.5-hr. flight late last week, he was surprised when the plane landed at Labrak. The men were put on buses and taken to an army base in al-Baida. Then, says Ali, a protest outside the base turned into an intense firefight between those outside and those inside. At some point, the soldiers on the base offered the men from Sabha weapons. "They told us the people of this city want to kill you because there are rumors that there are mercenaries among you," Ali says. By the night of Feb. 18, soldiers began to defect, joining the revolution. And that's when soldiers turned to the men from Sabha and said they should run, or they might be killed, Ali says. He surrendered when ambulances pulled up and the people inside were informed that they wouldn't be hurt if they laid down their weapons. He and a group of other prisoners were taken to a nearby mosque and guarded by local elders, he says. "At the same time, there were people outside who lost their relatives in the clashes, and they were shouting. One tried to attack us. People at that time didn't know who's Libyan and who's a foreigner." The notion that Gaddafi is employing foreign mercenaries to fight his own people is an outrage, a feeling shared by al-Jalil, the former Justice Minister as well as army officers. But it's also a tactic that, some say, their leader has used before. Indeed, many of the prisoners at the Aruba School are dual nationals  Libyans with roots in Chad or Niger. And some are entirely foreign. Three men, two 19-year-olds and an 18-year-old, crossed the porous Saharan border from Chad into Libya's south just a few weeks ago, looking for work. They wound up on the Aruba School floor, they say, after being told by a taxi driver in Sabha that they could get a free plane ride to Tripoli. Other prisoners raise their hands when asked if they're members of "Khamees' battalion"  an allegation spread widely beyond the school's walls. Khamees is one of Gaddafi's sons, and al-Jalil says that each son controls a unit of Libya's military. "Every one of Gaddafi's sons has an army and does whatever he wants with his army," he says. The residents of Libya's east remain angry, particularly as accounts of ongoing massacres in Tripoli spill across the spotty phone lines. But the guards at the Aruba School say their prisoners won't be hurt. Still, like most Libyans awaiting the collapse or survival of Gaddafi's 41-year regime, their fate hangs in the balance. See pictures of Muammar Gaddafi's rule. 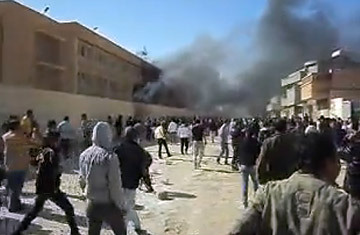 See pictures of Libya's unrest.